Data Storage « Global Market Insights, Inc. Rising urbanization and infrastructural developments have noticeably stimulated global LiDAR market size over the recent years. Increasing number of projects along with high degree of efficiency and multi-viewpoint data collection worldwide are poised to bring interesting developments in the LiDAR industry trends. According to report by Global Market Insights, Inc., “ LiDAR Market share is predicted to surpass a revenue of USD 1.1 billion by 2023.” Emerging technological advancement such as optically extended MEMS (micro-electro-mechanical system) scanning mirror will boost the demand for LiDAR technology across low-altitude and light weight flying platforms. A few of the major applications catered by Light Detection and Ranging technology include civil engineering, government, military & defense, corridor mapping, and topographical survey. 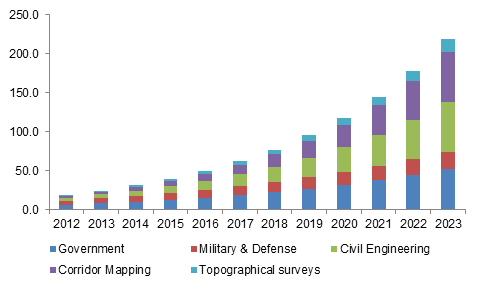 LiDAR market share in the corridor mapping applications will witness a CAGR of 21.5% over the coming six years. The expanding civil sector will further lucratively influence the LiDAR industry outlook. The capability of LiDAR to provide high accuracy and detail local elevation data while surveying roads and construction projects will drive the application demand. Moreover, increasing implementations of this technology across the government sector will catalyze LiDAR market revenue over the coming period. As per the study, the government sector will lead the application landscape with revenue over USD 340 million by 2023. 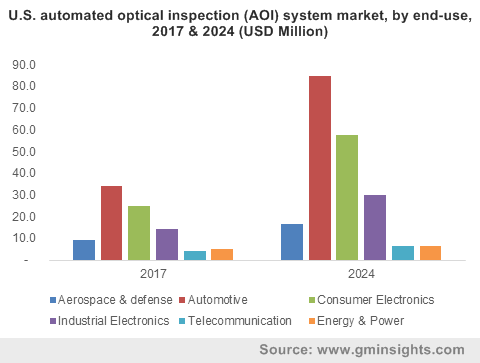 LiDAR market will also attain noticeable surge owing to the revenue generated from its products such as mobile, airborne, terrestrial, and short range technologies. Airborne LiDAR market dominated the product landscape by accounting for of 40% the total share in 2015 and is projected to surpass a revenue of USD 400 million by 2023. The growth can be attributed to the implementation of advanced technological features such as multi-target capability and full waveform analysis in airborne mapping. Mobile LiDAR market will grow significantly with a CAGR of 22% from 2016 to 2023. Increasing usage of mobile mapping across wind projects, transportation agencies, and urban data acquisition will drive mobile LiDAR market. Laser scanner will exhibit a CAGR of more than 17% over the period of 2016-2023, owing to its growing application in 3D scanning market and imaging maneuvers. Moreover, Data storage & management system, navigation, and GPS components will contribute positively towards LiDAR industry growth. US will contribute significantly towards North America LiDAR market share and is predicted to witness a growth rate of 9.3% over the mentioned timeframe. The increase in industrial automation and rising adoption of 3D imagery by US government are the major driving factors of North America LiDAR industry outlook. Key market players are poised to offer advanced and cost-effective solutions to sustain their position in the LiDAR business. Heavy investment and strategic alliances will characterize the LiDAR market size over the coming six years. Key industry participants include Renishaw, Faro Technologies, Leica Geosystems, Intermap Technologies, Trimble Navigation, RIEGL, 3D Laser Mapping Ltd, Aerometric. This entry was posted in Sustainable & Smart Technologies and tagged Airborne, Como LiDAR, Data Storage, Global LiDAR Market, GPS, Laser Scanners, LiDAR, LiDAR Market, LiDAR Market Analysis, LiDAR Market Forecast, LiDAR Market Report, LiDAR Market Research, LiDAR Market Share, LiDAR Market Size, LiDAR Report, Management Systems, Mobile, Navigation, Short Range, Terrestrial.